- You can either paint the small branch or leave it au natural. Place it in a small vase with pebbles, nuts, corn kernels, or anything else festively fall. - Cut leaf shapes out of the construction paper. - Write something you are thankful for on the leaf. - Tie the leaf on the branch with ribbon. It's a great way of reminding yourself and those close to you of the things you're thankful for. This would also be cute for a grade school class project. 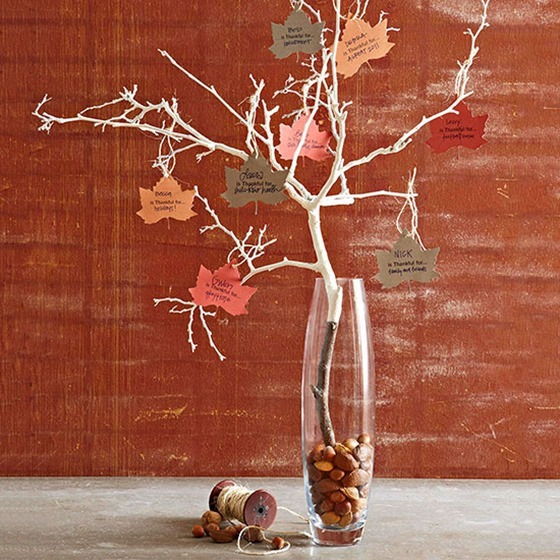 Use a slightly larger branch (or a fake tree without leaves) and have the children write something they're thankful for. See, we're already changing things up from the Better Homes and Gardens tutorial!